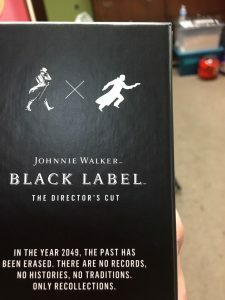 Johnnie Walker is home to exceptional Scotch Whiskies in the present and is now tapping into the future with their limited edition Black Label The Director’s Cut. Seriously though. But how could one create a whisky of the future in the present you ask? Well, you’ve come to the right place. 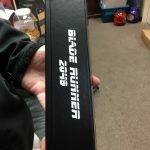 You could also call this whisky Johnnie Walker Blade Runner due to its roll in the new movie Blade Runner 2049. 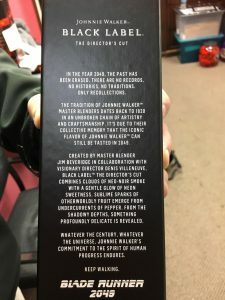 In fact Blade Runner 2049 is the whole premise around the creation of this overly exception whisky by master blender Jim Beverage in collaboration with the visionary filmmaker Denis Villeneuve. Johnnie Walker Black Label The Director’s Cut is compromised of over 30 different malt and grain whiskies. Futuristic products are adaptations of what we have now, and combining as much as 30 whiskies together to create a new one is certainly a thing of the whiskey future. It is honestly amazing that so many different recipes could come together to create such a smooth and delectable taste. 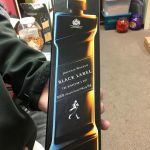 This limited edition scotch whisky presented in a futuristic bottle takes the original trademark of smokiness and exceeds it with a contemporary twist of sweet fruity and vanilla flavors. 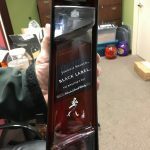 This Whisky appears yellow and is bottled at 49% ABV. Nose: It has a uniformly pleasant scent of marshmallow, honey, and crisp red apple followed by golden raisins and figs, finished off with subtle notes of green tea. Palate: You can definitely taste more than you can in the original. It goes down very smooth with tastes of leather, himalayan salt, spice, black pepper, black tea, cotton candy, powdered cocoa, taro root, caramel, dates, golden raisins and a slightly bitter note of chicory. Finish: The finish is medium in length, with pleasant lingering flavors of black pepper, oak tanin, coal lla peat and chicory. “A spicy tingle that lasts the death. Now that you’re hooked on this futuristic whisky, it doesn’t stop there. You can make the Penicillin 2049 at home! This is a futuristic twist on a classic cocktail, using ultrasound technology to create a sensory cloud of ginger essence. Pour 40mL of Johnnie Walker Black Label The Director’s Cut into a cocktail shaker with ice. Add 30mL clarified lemon juice and 30mL of honey syrup. Strain contents over large cold draft ice cube in a rocks glass. Cheers to the future and exceptional whisky!